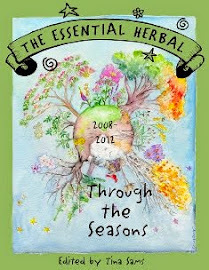 Here's the cover of the latest book - to be released June 12th, debuting at the Soap Bee in Ft. Wayne. 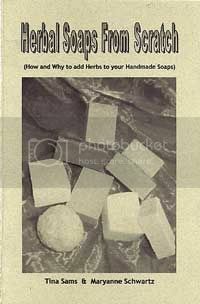 It is 40 pages jammed with information on how to add herbs to your handmade soaps, and why you'd want to do that. We did lots of research, made lots of soaps, and learned more than we expected in the process. Since we'll be speaking on this topic, we thought it would be fun to put everything together in one place for those interested in learning more. 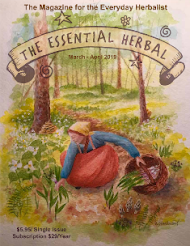 It will be available on the website after we return from the Bee. 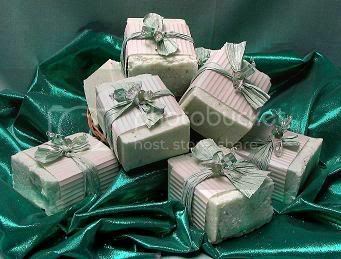 $4.95 retail, it will also be available wholesale to shops. Posting twice in a day! - Wow. It was such a busy day which isn't necessarily a good thing :-), but after the flea market it was off to a family picnic. When that ended, the kids went inside to watch Star Wars and my sister and I finished the book we've been working on about using herbs in soaps. It goes to print tomorrow, by the way. Leaving, the sky was dark on one side and brighter on the other. 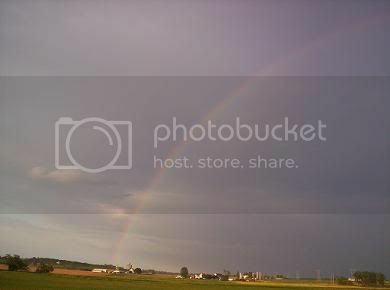 I mentioned to daughter Molly that there would most likely be a rainbow if we looked for it, since it was drizzling. Sure enough! There it was. And all the way home it did this leap frog thing, so that it was always ahead of us. For a few minutes, we thought there might actually be a pot of gold on the doorstep at home, but alas, the rainbow went ahead without us. This morning there was a huge antique/yard sale in a small town nearby. Every house throws their stuff out on the yard every Memorial Day, and there are large fields of flea market tables on either end of the town. 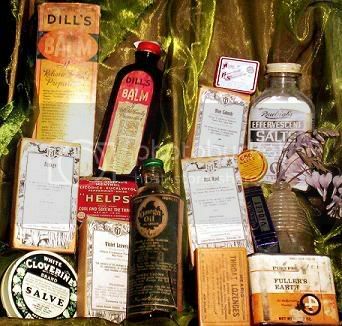 My latest obsession is finding old medicinal herbal cures and packaging. The boxes are full of herbs from the Indiana Botanic Gardens. There was Blue Cohosh, Red Root, Borage, and Violet leaf. The bottle of Omega Oil is mostly chloroform. The Dill's Balm contains oils of sassafras and clove, turpentine, myrrh, cayenne pepper, camphor, madder and ammonia water. The throat lozenges also contain chloroform, in addition to cubeb, licorice, linseed, capsicum, anise, acacia, peppermint and sugar. I also found a beautiful tin from Anusol Hemorrhoidal Suppositories, containing Bismuth and "Nicaraguan Medicinal Balsam" with zinc oxide and cacoa butter. I think these are just fascinating. On Saturday I checked out the Baltimore Herb Festival. The festival wasn't held last year, and we were all worried about how it would do - having lost momentum. Unfortunately we arrived as a storm blew through. We got to spend a good bit of time catching up with Barb and Roger Steele from Alloway Creek Garden while standing beneath a giant holly tree, but eventually gave up on shopping. Most of the vendors were closing up shop due to the weather. Those we spoke to were thrilled with the turnout AND with the buying spirit of the crowd. That is great news! In fact, when the storm passed they went on to sell much more. As for us.... well it stopped raining as we got back onto the highway. Oh well. My daughter experienced a very anxious time when she entered second grade in our local public school. She would come home - after what perhaps seemed like an endless day - and say that nobody liked her, that she was dumb, and didn't want to go back. She was very insecure. All of my comforting and reassurances during the evening hours didn't help as she stepped onto the bus and began another anxious day. At that time, Beanie Babies were very popular and, with this in mind, I decided to make her very own little baby, in the form of a little cat, stuffed with dried lavender flowers. I knew the aromatherapeutic benefits of lavender would help ease her anxiety, but not wanting to add to her stress, I thought better of making her cat appear too "babyish". The cat was made out of black satin, although any tightly woven cloth would work, and a pretty flannel would be very comforting. The finished cat was a mere three inches high and two inches wide with string whiskers and a bow tie. She was thrilled when presented with the little kitty, and slept with it that night. The next morning it went right into her backpack and it wasn't mentioned again for a while. Several weeks later I was asked to assist in a classroom project. Arriving at her room, I noticed that my child had her head stuck IN HER DESK with the top pulled down over her. Wondering what she was up to, I made my way to her desk and was met with the sweet aroma of lavender. My daughter finished her school year with success, boundless energy and a smile. The kitty came home, flattened and well used. The lavender flowers had turned to powder, but had done their job well. When third grade loomed ahead, the sad little kitten landed in my lap with a request for a refill. It was simply a matter of opening a small seam, stuffing in the lavender, and sewing it back up. Off to school it went for another year. Then another. Now as she nears the first year of high school, I'm wishing things were as simple to fix. Now that the woods are getting so overgrown we decided to take the frogmobile out. 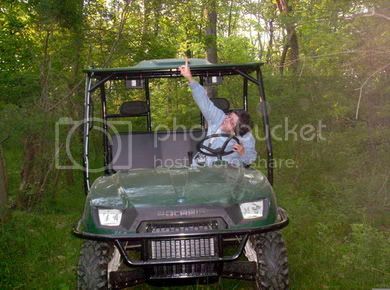 That's my sister driving... er, well not exactly driving, but pointing out a bird. There's a heron rookery nearby and lots of water. It was a lot of fun, sort of like the wild safari ride at a theme park, except there wasn't that feeling of being safe. As you can see, this picture was taken in one of the very few level spots where we "weed walk". Soon the path will be mowed so we can walk it, but the creek is maybe 50' to the left, and it was tough to get to last night. I found several spots where deer had flattened the high foliage to bed down. Oddly we didn't find a single tick when we got back. 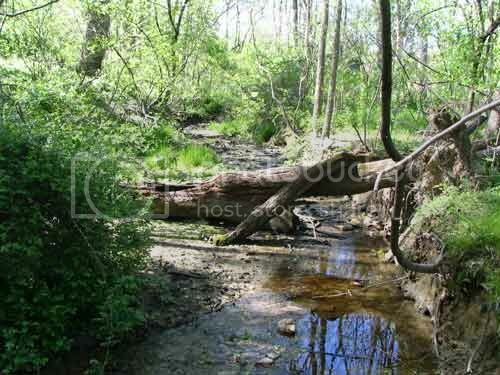 This is is stark contrast to the situation any time I get in the woods near my own house. The False Soloman Seal and Phlox were just about killing themselves! They covered the woodland hillsides and looked beautiful. Got a new camera... so there will be plenty of pictures. The Twisted Sisters Ride Again! 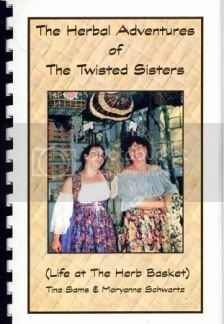 Some of you may know me from the old "Twisted Sisters" days. 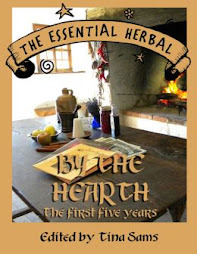 This book - The Herbal Adventures of the Twisted Sisters, by Tina Sams and Maryanne Schwartz - was our first trip into the world of publishing. Well, that, and our shop newsletter. Well it just so happens that Maryanne and I are headed for the Ft. Wayne Soap and Candle Bee www.soapbee.com where we will be speaking on the use of herbs in soaps, setting up a vending table, and taking in the other speakers. It'll be a great opportunity for Maryanne to put her tiny handmade glass vessels (aromatherapy pendants - www.torchsongstudio.com )on public display and get some input. Oh and by the way, the book is available at our website. 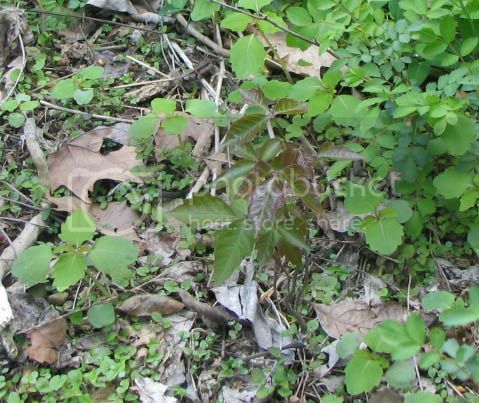 In this picture there is some shiny, somewhat reddish poison oak/ivy surrounded by very young jewelweed plants. In another week or so, the jewelweed will be knee high with orange or yellow flowers that are sort of a cross between a trumpet and a snapdragon. The leaves are bluish green, and when there is moisture on them it beads up and sparkles - hence the name "jewelweed". Jewelweed is a wondrous healer of many summer maladies - most of which are found wherever it grows. Stinging nettle rash is almost immediately relieved by rubbing the juice of the plump stem on the burning skin, mosquito bites stop itching, and poison ivy or oak heals very quickly. My favorite story about jewelweed occurred while I lived and worked on a very large farm situated amidst a very old forest. One of the farm workers had gotten help planting from his bride, who wandered off into the woods during the day to make like a bear. Apparently she had been WAY too close to poison, and the following day when he came to work, it was quite obvious that she had shared it with him. The poor boy was nearly unable to walk. I went quickly to the creek and picked a mass of jewelweed. It went into the blender, and I gave him a handful of the mush and sent him into the bathroom to put some of the liquid on his oozing rash. The rest of the jewelweed was added to some melt and pour soap base for him to take home. Within a very short time - by lunch - he was feeling much better, and we kept the original handful in a dish in the fridge for him to apply from time to time. By the next day he was nearly healed, except for the scabs from where he had scratched it open the first night. The soap worked wonders on his companion, as well. This delicious and simple salad was served at an Herb Festival we attended several years ago. It is so GOOD! Drain Zucchini in colander. Sprinkle with 1 T. salt. Let drain 30min. Stir or shake twice. Squeeze dry. Transfer to large bowl. Fluff with hands to separate.Basil & olive oil in processor 1 minute, drop garlic in and blend. Add Zucchini to basil mix.Bring chicken broth to boil in medium saucepan. Stir in 1 T. salt and orzo, return to boil. Simmer 10-15 min. 'til orzo is tender. Drain. Stir all together and cool to room temp.Just before serving, stir in lemon juice (and zest if desired) Season with pepper. Garnish with olives and basil sprigs. We took a picture of the woods where we walk (top) so you can see what sort of place it is. 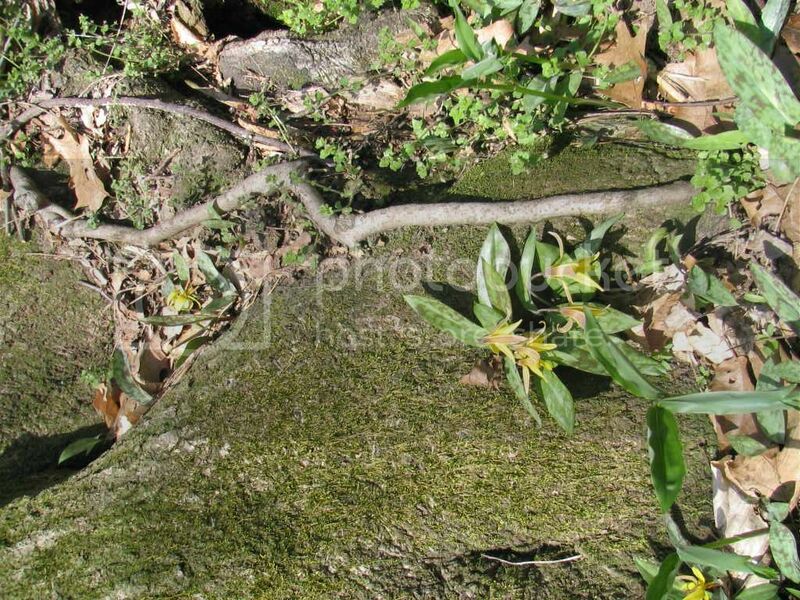 There is lots of climbing over fallen trees and following deer trails. 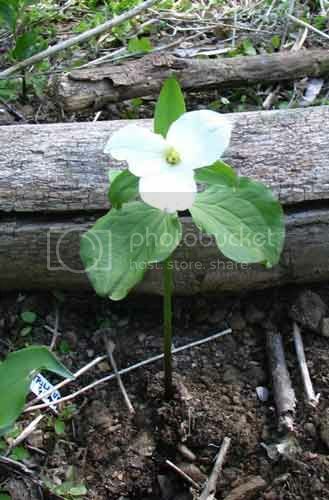 Above is the trillium I found at the Landis Valley Herb Fair (along with Wild Ginger and Toad Lily). 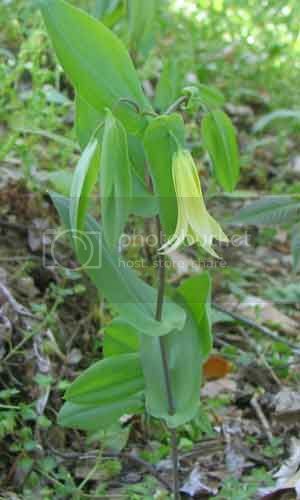 Below is what we believe is bellwort, but I'll have to do some research. It covers an entire hillside... well, actually sharing the area with the spring beauty, mayapple, and wild geranium. We realized that this will be one of the last times we will be able to walk into the creekside without a machete. Everything is growing so fast. The jewelweed that was only inch high little baby plants on May Day is now nearly a foot high. Guess we'll be doing some more of the crafting in weeks to come. This is some soap my sister and I made a couple weeks ago. It came out pretty well, and we had a great time with the packaging. Normally, we both make your typical cold process soap, so it was cool to try something different. We call these SPA bars. They are also called salt bars. The oil used is 100% coconut, and you add about 1/4 as much salt at trace. For instance, if you used 4 pounds of oil, you'd add 1 pound of salt. The salt makes the bar harden within a couple hours, and it has a creamy lather. My sister is WAY into beading (www.torchsongstudio.com and torchsongstudio.blogspot.com) and that inspired our packaging. Of course the batches were tiny - only 8 bars, so that helped :-). 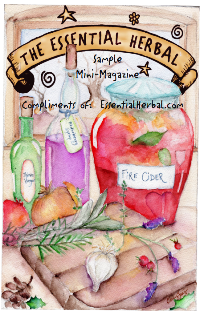 This article is excerpted from the Mar/Apr 2004 issue of The Essential Herbal. Clays have been used for centuries as a method to help beautify the skin. They are available as a fine powder and are present in almost all traditional beauty regimens. They exfoliate, clean and invigorate the skin while improving blood circulation. Clay has the ability to absorb excess oils, dirt and harmful toxins from the skin. The addition of herbs add even greater benefit. Cosmetic clays are made up of different mineral contents, and each clay type has a different effect on the skin. The high mineral content of clay rejuvenates the skin while the clay exfoliates and stimulates blood circulation to the skin. Regular use of clay facials will remove dead skin cells, improve circulation to the skin, remove drbris from the pores and bring about a smooth healthy glow. Each clay has the ability to absorb toxins from the skin, but they differ in their level of absorption. Choose a cosmetic clay and herbs that are suitable for your skin type. Citrus peel powders add astringency, rose petal powder adds fragrance, yellow sandawood powder helps dry skin and neem powder helps acne. Other ingredients that can be added are milk powders, honey powder, oatmeal and sea vegetables. Mix the powdered ingredients to make 4 oz. of dry clay facial and store in a 4 oz. jar. Clay facial masks should not be stored pre-mixed with the wetting agent. To use, add approximately 1/2 oz. 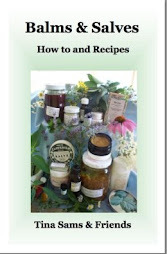 of the dry clay facial herb blend to a small bowl and mix enough warm water or hydrosol to make a paste. Add a drop or two of essential oil if desired. Apply to the skin in a gentle circular motion, and leave it to dry for about 15 - 20 minutes. Wash off with warm water, If the skin feels tight, a light oil such as camelina can be applied afterwards. Experiment with other wetting agents. Strawberry puree will act like an alpha-hydroxy. Cucumber puree cools the skin. Yogurt cools, and softens the skin, and milk removes dead skin cells and softens the skin. May and June are months that find us working in the gardens from early morning until the sun sets. We love digging, hoeing, and fighting with the roto-tiller. We move boulders, small mountains, and wonder why using a wheelbarrow looks so easy when other people do it. A flat of bedding plants that comes home from the nursery can become a never-ending source of guilt, and an innocent looking garden hose at 10 a.m. becomes a 2 ton boa constrictor by 4 p.m. The sun we longed for during the Winter now seeks us out, baking us with no mercy. Need I mention the mosquitoes, gnats, bees, and spiders? No, I think not. By the end of the day, we are grimy, smelly, and ache to the bone. How can you not love that? There is the feast for the senses that makes it all worthwhile. The birds sing their hearts out. The earth feels and smells like life itself. The plants that respond to touch by emitting their fragrance, and the dancing butterflies that flit about us while we work, all help to make it so very worthwhile. Now with a bit of forethought, we can end this experience (for today) with a soothing, fragrant, decadent bath. It is so easy, and lets face it…. We deserve it. Gather enough so that there is about a loose quart of leaves and flowers. Put away the gardening implements (no need to feel guilty later). Place the plant materials in the blender or food processor and pulse just enough so that the plants are bruised (this is where the Doctrine of Signatures comes in :->). Dump the mixture onto a one foot square of cloth and tie up the bundle. If bugs or plants have caused an itchy feeling, add ¼ cup of oatmeal first. Place the bundle in a stockpot with a couple of quarts of water and heat on the stove to a gentle simmer. Meanwhile, run a bath. Add a few drops of eucalyptus or peppermint oil for those muscles. Squeeze in some aloe gel to help with the sunburn. Get out the candles, add music, and pour yourself a well deserved glass of wine. Pour the contents of the stockpot into the tub. Climb in and reap the early rewards of gardening. Another feast for the senses.